It has just been announced that The Kasiisi Project is the recipient of a $24000 Disney Worldwide Conservation Fund grant for 2010. 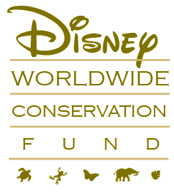 We are extremely grateful to DCWF, Disney Worldwide Conservation Fund, for their generous support of our conservation programs. This grant will fund phase 2 of The Kibale Schools Conservation Education Project which was launched in 2009 to promote conservation education in Kibale Forest schools by targeting the teachers. In addition we found that the children under their care showed better knowledge of the environment as well. We asked 1300 children to draw forest and savanna ecosystems and found a significant improvement in their ability to draw animals in their correct habitat after their teachers had been on the field trips compared with before the trips – see below for latest results. Phase 2 will extend the program into a new cohort of Kibale Forest schools, while at the same time continuing to build on gains made in current schools. 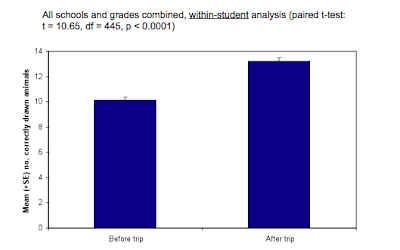 A Graph showing animals drawn by students in their correct habitat before and after teacher trips to local National Parks.